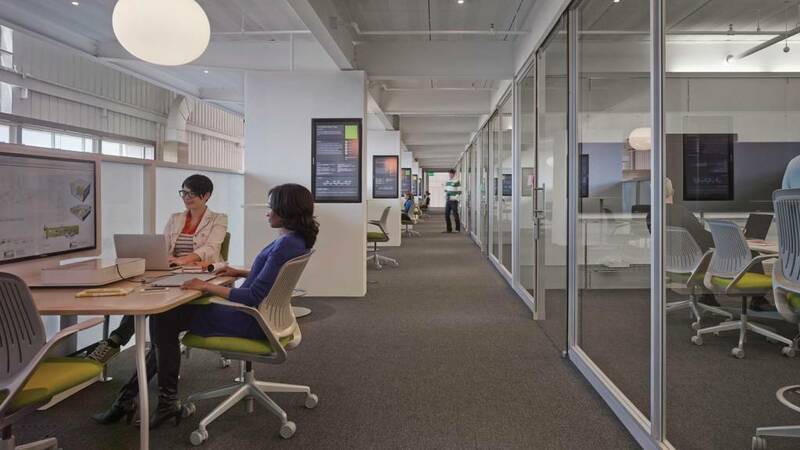 Steelcase uses space to help drive culture change in the organization and better align people, culture and work processes for a fast-changing business world. Two years after we began reinventing our spaces, here’s a look at what we did and what we’ve learned along the way. 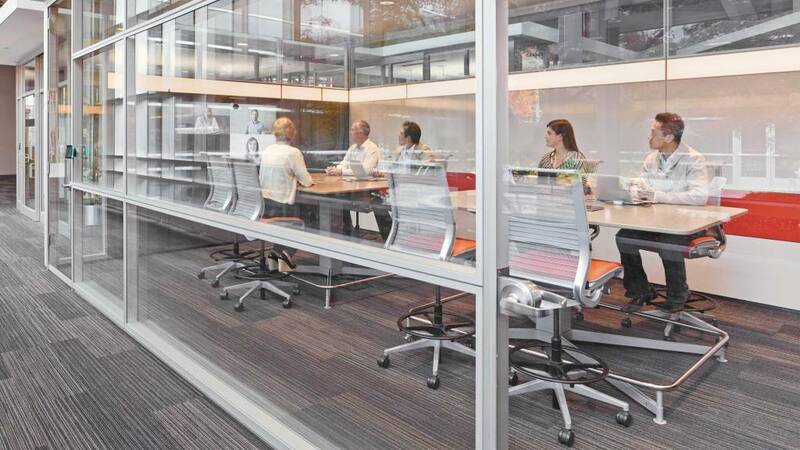 “This past year Steelcase reported its best year since we began to feel the impact of the economic downturn in 2009. We didn’t just survive the global recession—we came out of it healthier, stronger and ready for the future. It may be tempting to use a recession as a time to hunker down, but instead we reinvented ourselves, accelerated change, and invested in our future. For example, we invested in our brand, globalized our product platforms and worked towards becoming a globally integrated enterprise. Jim Keane, President and Chief Executive Officer, Steelcase Inc.
We knew the office was changing, but it wasn’t going to go away. While we had to free up excess space, we looked at the problem through a different lens. We believe that, more than ever, people need places where they can come together, feel connected and build a strong sense of purpose. We challenged ourselves to use our real estate strategy to do more than just cut costs. 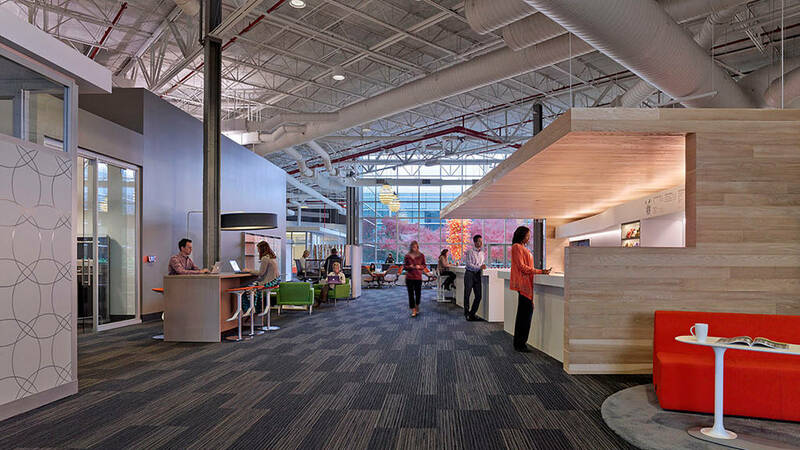 We viewed it as an opportunity to optimize our real estate at our Global Headquarters campus in Grand Rapids, Mich., by activating space that as relatively unused before, as well as use our workplace strategy to accelerate the evolution of our culture. It was a tipping point for our company. When our leadership team reviewed the real estate strategy and presented the financial argument, it was an easy decision on those terms alone. Real estate and costs would be reduced by half. From a numbers perspective, it was an easy call. But as a leadership team we said we wouldn’t do it if it didn’t shape the culture of the company. It was the most important reason to do this project then, and it remains the most important one today. Employees are together on one campus where they can easily connect with their colleagues, their work and the organization. There is a buzz that just wasn’t there a couple of years ago. It’s undeniable. Our new work environments have changed us as an organization. It’s obvious to everyone, including visitors to our spaces who tell us they can sense the essence of our culture and brand through the space. And they are just as interested in learning more about that as they are in our furniture. The new Innovation Center is a place for project teams to focus on generating new ideas and exemplifies how places can help bring distributed teams together to innovate. In the face of an economic crisis, the first thing business leaders think about is rarely their offices. Unless, of course, it’s on a list of things that can be cut to save money. Which is what a lot of companies were doing in 2009 just after they watched well-established organizations collapse around them. There was a lot of uncertainty everywhere, and Steelcase, which serves many Fortune 500 companies, had a front-row seat to the chaos. This was the driving force behind our reinvention project, dubbed Connect 12 internally, a multi-year odyssey to reinvent the headquarters campus and help employees from around the globe to be physically and virtually more connected. We chose our 100th anniversary in 2012 as a rallying point for change. The project would reinvent existing buildings on our main campus, including former manufacturing facilities, plus off-load unused real estate and create an interconnected global network of spaces. 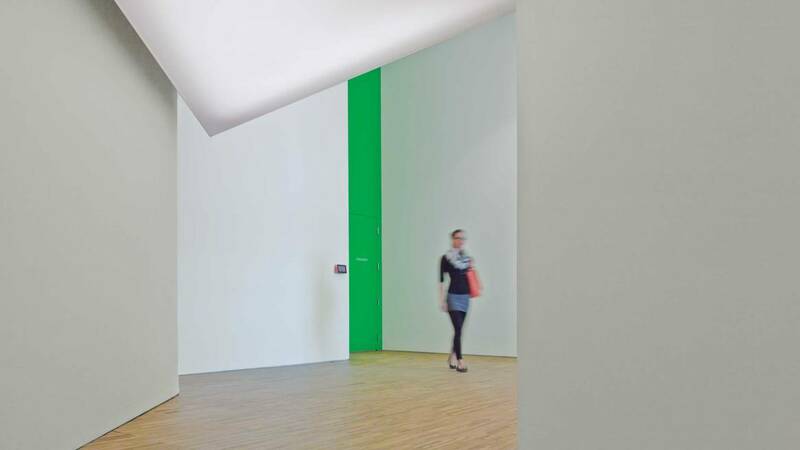 These spaces would challenge the purpose of the workplace and test new ways of working. “We set out specifically to use the work environment to improve employee engagement and retention, to boost internal communication and renew our company culture,” says Hughes. 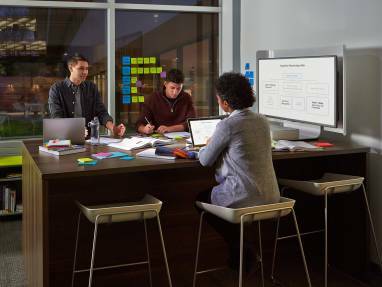 The insights gathered from these activities were used to build behavioral prototype spaces to test the new work environments and help employees understand the impact of the changes. Some groups were asked to live in the prototype spaces to help validate the design direction. 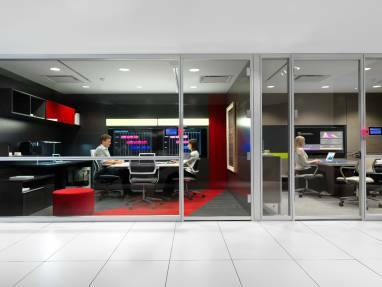 Environments incorporating media:scape technology allow employees from around the world to be physically and virtually more connected. At its essence, the “best place” concept is about supporting the wellbeing of employees in a holistic way, considering emotional and cognitive needs as much as physical ones. There is a range of spaces that support focused work, collaboration, learning, socializing and rejuvenation. For example, if employees have a task that requires deep focus and concentration, they can perform better cognitively if the space supports that mode of work. Routine tasks don’t create the same cognitive load and can be done in areas where there is more stimulation and interaction. People are also free to choose the kind of space in which they want to work based on their emotional frame of mind. Sometimes people crave interaction and want to be in the middle of activity and other times they need more solitude. Physically, people need to move throughout their day and change postures—not just to sit or stand, but also to lounge or perch. Movement is essential to maintaining energy levels and stamina. And all three aspects of wellbeing—physical, cognitive and emotional— are essential to building a high level of employee engagement. 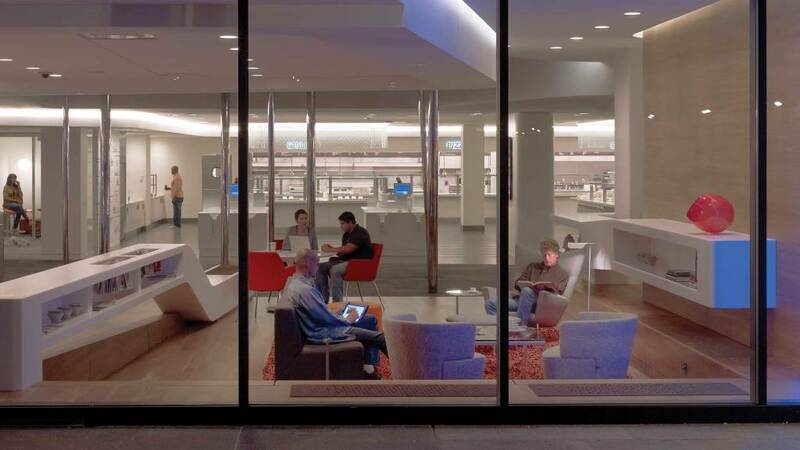 The “best place” strategy creates a campus environment with an ecosystem of spaces that support focused work, collaboration, learning, socializing and rejuvenation. The global network of spaces includes areas for individual work and group work, some of which are “owned” by the individual or team if needed, and many that are shared. There is a blend of open spaces, along with spaces that are enclosed or shielded, so people can choose the degree of interaction they want. The Connect 12 project team understood that people need both privacy and interaction throughout their day, in varying degrees. The cornerstone of the “best place” strategy and the first area to be introduced was a repurposed space. Previously an under-utilized cafeteria used only for morning coffee, lunch and afternoon break, the new WorkCafé is an on-site third place, as sociologist Ray Oldenburg would call it, with an informality and diverse user group. This is the “hub” for the campus and testing ground for several new concepts and applications. Food and beverages are available throughout the day in WorkCafé, but what makes the space popular is the diverse choice of spaces available for focus and collaborative work, as well as spaces that support social interaction and respite. A 24’ x 5’ media wall offers continually updated news from around the company and around the world. This concept was implemented not just at headquarters but in all our spaces, so workers in the U.S., for example, can learn about what’s going on in Malaysia or Moscow, and vice versa. media:scape collaborative settings help people share digital content more effectively, and access to power and Wi-Fi is ubiquitous. Introducing the new workplace strategy with a space like the WorkCafé was unusual, compared to the more conventional approach of focusing on individual workspaces first, but it clearly worked. 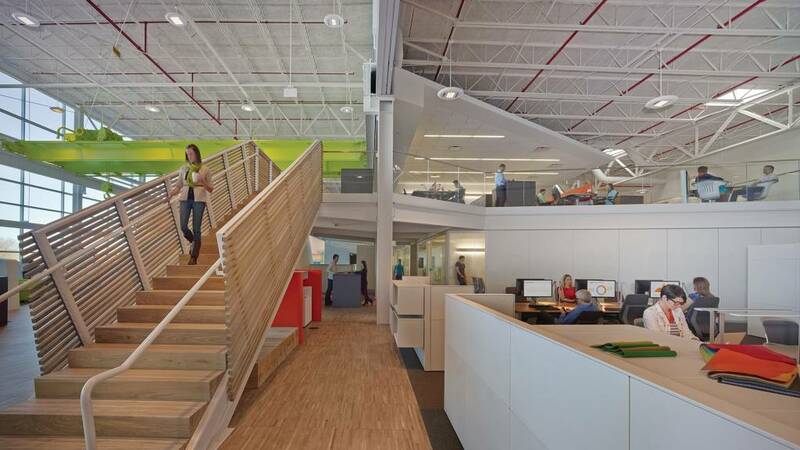 “It’s no exaggeration to say that at Steelcase, everyone comes to WorkCafé,” says Johnson. “It’s a central, welcoming, multi-use space with a great buzz. You see leadership, people from other parts of the company, visitors, customers. You meet people face-to-face instead of over the phone or email, so it builds rapport and trust across the company. People said the space made them feel proud and that it demonstrated how much the organization really valued them as employees. WorkCafé offers the functionality of a well-planned office with the vibe of a neighborhood pub. Outdoor spaces allow for rejuvenation and socialization, as well as real work. Before the campus reinvention, 95 percent of residents in our global headquarters had assigned desks. But given the mobile nature of work today, not all employees needed or wanted an assigned workstation. The assigned workstations that sat empty much of the time were not allowing that real estate to be fully leveraged and also impacted the outlook of employees – sitting among empty cubicles feels isolating and drains people’s energy without them even realizing it. Yet some people’s jobs required them to be at their desks most of the time, and they needed their own workspaces. To help identify which employees should shift to mobile work, we asked for volunteers. “It was important that employees felt like they had a voice in the decision, and that their voice was heard,” said Johnson. Not surprisingly half of the employees chose to give up their dedicated desks, knowing they would have greater flexibility. Spaces that had previously been used for dedicated workstations could now be used for different types of work environments to support both focus and collaborative work, as well as the social needs of people. This change enabled the company to bring employees together in less space and, at the same time, give them more choice and control over where and how they work. For example, a 24,000 square-foot (2,230 square-meter) wing of the headquarters building that originally housed only one department was gutted and rebuilt for three groups: finance, procurement and quality. Another wing was similarly reinvented for sales support staff, bringing together teams that had never been able to be collocated before. It also incorporated videoconferencing spaces that allowed people to work informally with remote teammates on a daily basis. Both floors can serve more people now that employees can choose from workspaces anywhere on campus. 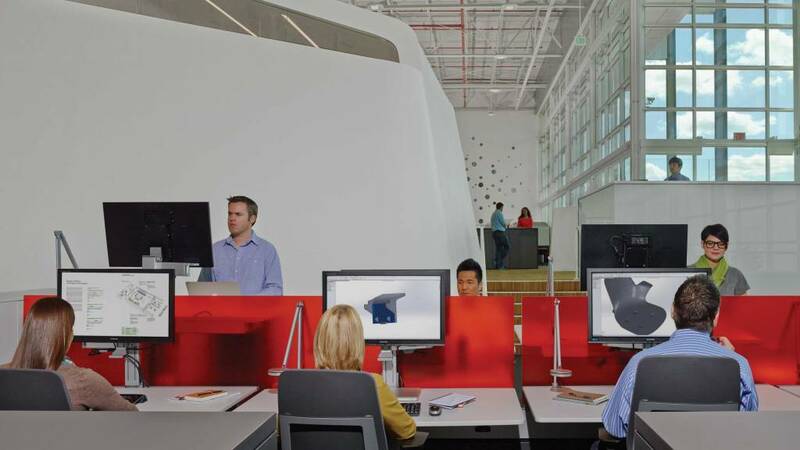 New work environments offer workers more choice and control over where and how they work. Spaces that had previously been used for dedicated work stations are now used for different types of work environments that support both focus and collaborative work. This was a very different way of working and it required managers and employees to better understand what this meant. “We used a series of engagements and online resources to help managers learn to lead differently, to set objectives and measure performance instead of counting heads and measuring seat time,” says Steve Wolfe, director of corporate human resources. 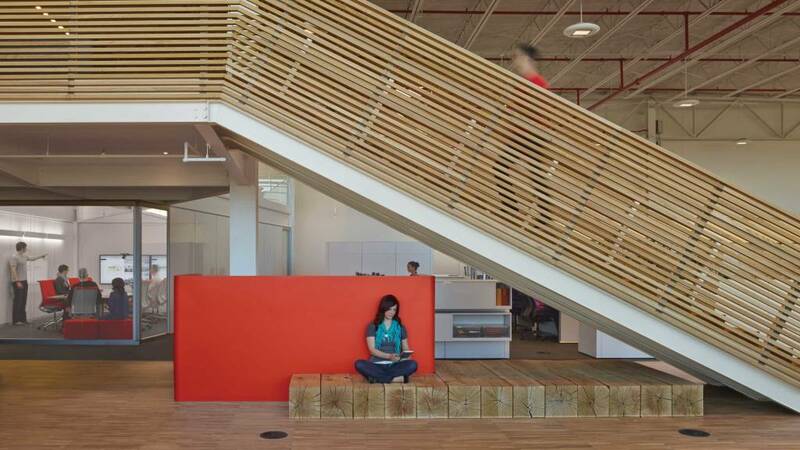 New work environments support a range of postures. Movement is physically energizing and mentally stimulating. 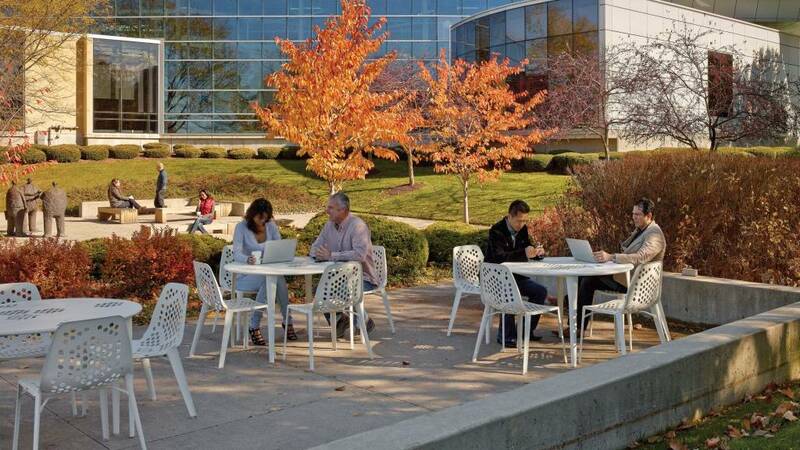 Support for varied postures, along with more natural light in workplace interiors, an outdoor patio and other connections with nature, are some of the ways Steelcase leverages real estate to support employee wellbeing. The Nourishment bar and its surrounding work areas help people reenergize and shift between different modes of work. Another newly repurposed place on our headquarters campus is the Innovation Center which, like all of our spaces, is a prototype to test new ways of working. It was driven by the organization’s need to thrive in a fiercely competitive global economy. “We wanted to confirm our belief that ideas get even better when we have a team that is not only diverse professionally or ethnically, but also geographically. People who come to the innovation process immersed in the sights and sounds of other cultures bring a deeper layer of insight to the problem at hand,” says Johnson. The Innovation Center serves almost 300 local employees and distributed colleagues around the world. Since three-quarters of our product development projects are global and we have design studios on three continents, the center exemplifies how places can shape a global, integrated enterprise. Project studios in the Innovation Center connect distributed team members around the world. 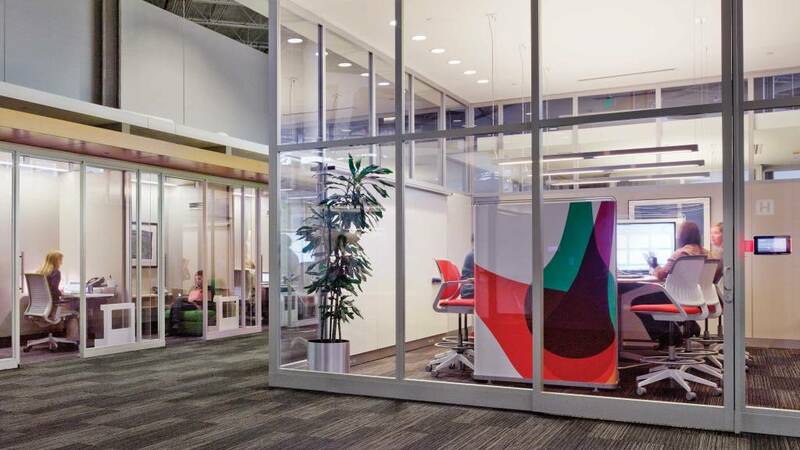 The Innovation Center is a prototype to test new ways of working and was driven by Steelcase’s need to connect their globally distributed product development teams. Group spaces rule here. Project rooms occupy 40 percent of the footprint, while “front porches” and “back alleys” support a variety of small group work activities. Team members, including designers, researchers, product marketers, engineers and other staffers, keep in touch daily via telepresence. 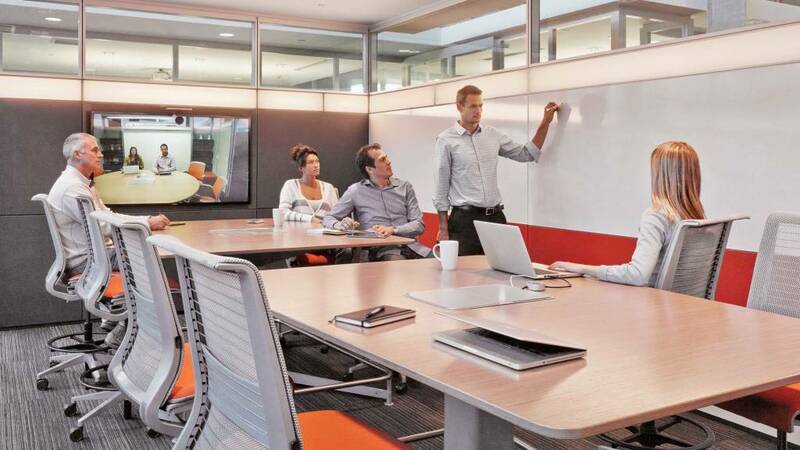 To avoid the typically formal and often awkward videoconference, employees can choose from a variety of configurations for their project rooms with café tables, lounge chairs and other furniture so participants can stand, sit, perch or walk around. Close-ups and one-on-one exchanges make gestures and facial expressions clear and help improve understanding. Plus, each project room also has space where people can break away from active collaboration but stay nearby to rejoin as needed. 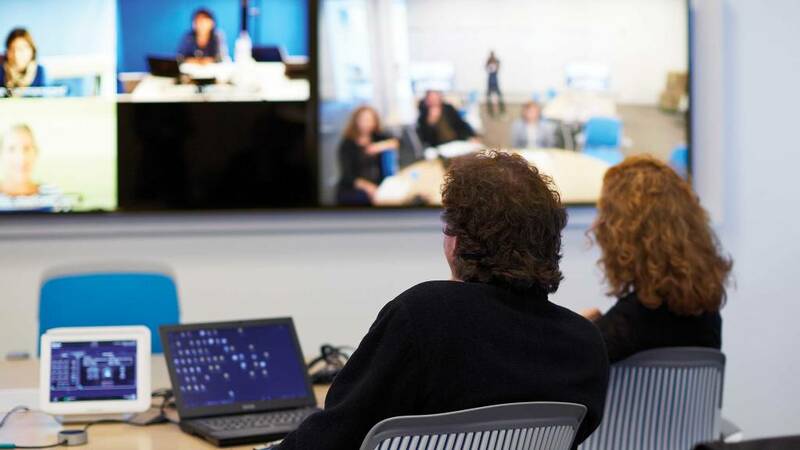 It all makes for videoconferences that are informal, collaborative and productive. The center also includes R&D labs, a prototype studio, guest interaction rooms, mobile neighborhoods, enclaves and a café. “It gives people the variety of spaces and tools they need, yet the floor plate is simple and designed for evolution. We allow the campus spaces to ‘learn’ with the people who use them, and that makes for more resilient real estate,” says Johnson. Workspaces ‘learn,’ adapt and better support culture change only if people support it. By benchmarking the company culture at the onset of the project, we can measure how our culture is evolving and adapt spaces as needed. Engagement, a measure of how well employees feel a sense of shared purpose, has also improved. “It was a strength in 2010 and it’s an even greater one now. That unites the company,” says Banack. 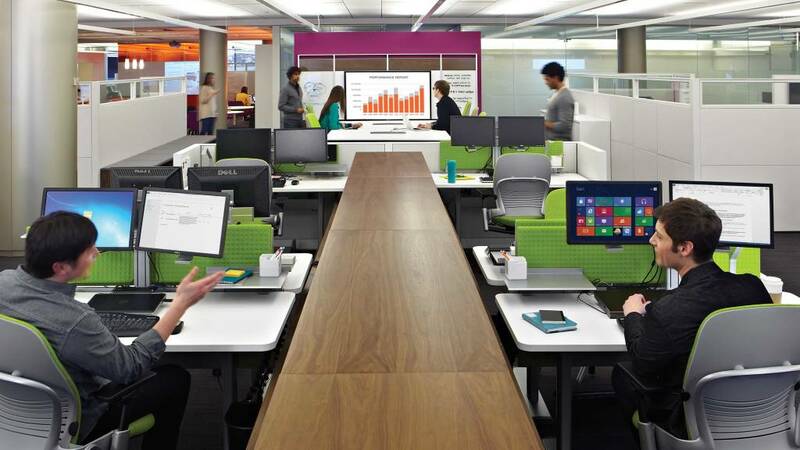 Steelcase leaders see tangible, bottom-line benefits. “Our sales support groups have been able to absorb double-digit growth in our business two years in a row, without increasing staff. It’s not more hours. 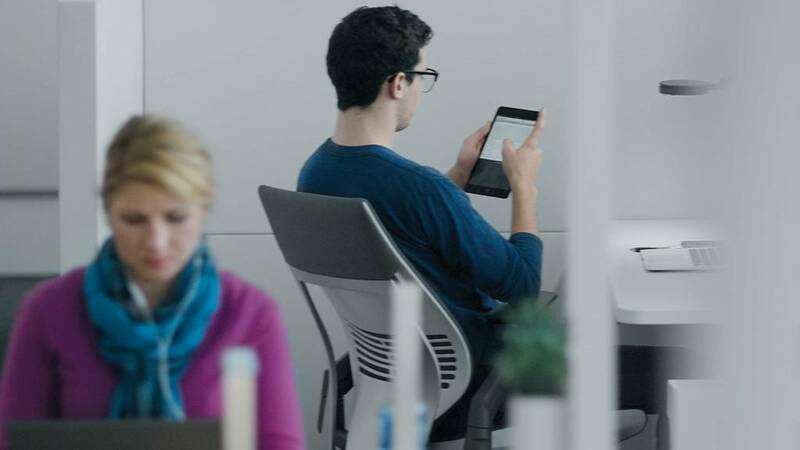 It’s just easier to get things done now, to connect, collaborate and make decisions more efficiently,” says Eddy Schmidt, senior vice president. Our feedback loop uncovered that after the first wave of changes we needed more places for people to focus and concentrate. So we added more individual enclaves near collaboration spaces. 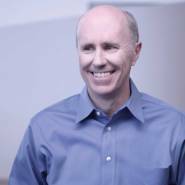 Dave Sylvester, chief financial officer, says feedback from his team is “off the charts.” Half of his staff is mobile, choosing shared benching workspaces as their daily home bases, and 62 percent report their workplace helps attract and retain employees. Fine-tuning—reconfiguring a space here, changing a furniture application there—has helped, too. We learned that people needed more spaces for private conversation and focused work, and those changes have been made. Project teams also needed more spaces they could own for the life of a project, so more “we/owned” spaces were added. No one knows how creative knowledge work will change in the future, so our workplace is intended to be tested, and can evolve as needed. Changing company culture is difficult. 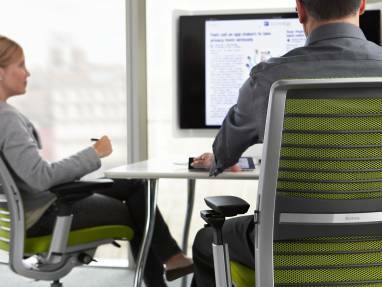 The physical environment is not the only influencing factor, and Steelcase leaders recognize there’s work to be done on other fronts. Five years after initial planning for the new corporate campus, no one is surprised by the results. “It’s changed how we live and work as an organization. It’s that simple and that profound,” says Ludwig. Our new spaces help people connect with the brand, the culture and each other. 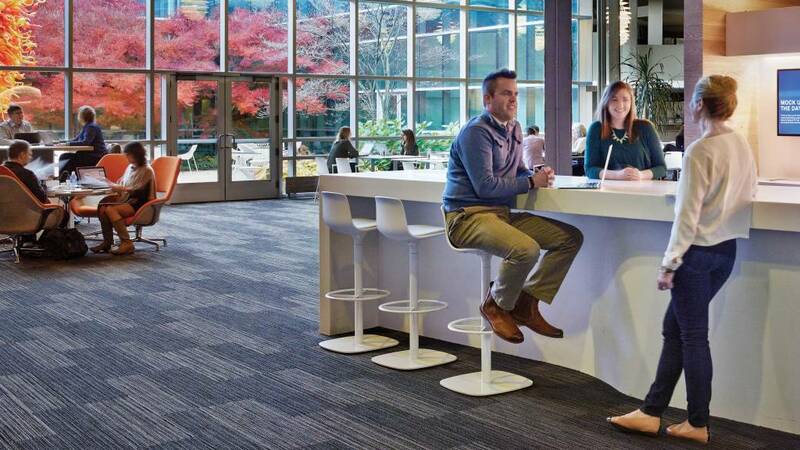 By rethinking its real estate strategy, Steelcase was able to reduce the actual footprint of our corporate headquarters campus by 48% and our environmental footprint at the same time. But, more important, the results of pre- and post-Workplace Satisfaction Surveys indicate the impact the changes have made on people, processes and culture is far more valuable. 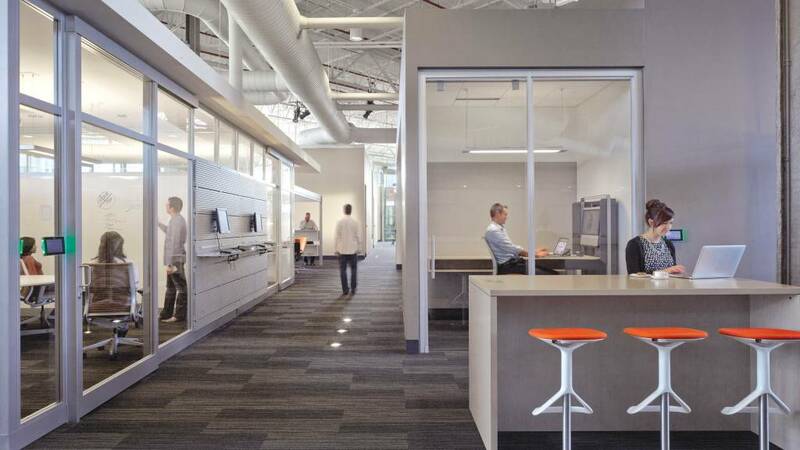 *The survey results identified the need to balance more private spaces with collaboration settings and Steelcase has since added additional enclaves and other private spaces to the company campus.